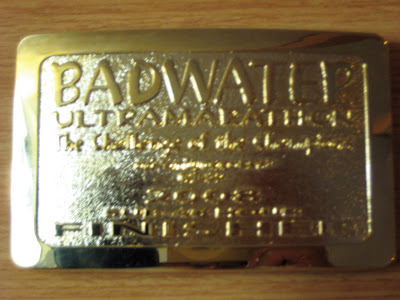 Got back late last night from crewing and pacing at the 2008 Badwater Ultramarathon. 135 miles of success, as our runner, Jacki Florine, well exceeded her goal and buckled (45:18:19). The entire crew (Meredith, Eddie, Peggy, Mike and Paul) was amazing. I got a chance to catch up with a few old and new friends on and off the race course, including Jaime Donaldson, Dean Karnazes, George V., Terry M. and Lisa Smith-Batchen. Jaime put forth a world-class performance - not only did she shatter Pam Reed's 2002 women's record of 27:56:47 with a 26:51:33 finish, but also she bested all but two of the men running in the race. I had the pleasure of running (or, maybe it was more like trying to keep up with her) and chatting with Jaime for about 100 yards early in the race, and although this is a race where things can change very quickly, it looked to me as if she simply had it ! Jorge Pacheco was the overall winner with a sub-24 hour performance (23:20:16). It's off to the Vermont 100 this morning to pace Wayne. More to follow on both Badwater and Vermont, but for now, enjoy the below slide show of pictures from Badwater. Warning - it is HOT at Badwater, and the crew got a little loopy over the course of 45+ hours on the go, so, don't use any of the photos for blackmail ! and wow your back on the road to VT ... Have a great time and I will catch ya on the cell. Now I know who to call when I'm ready for BW, crew chief Tony! Great job to you and the whole crew team, and of course, to Jackie. What an awesome time! Congrats to everyone who finished. So it was really hot, huh? Wow, you roll with some famous homies! Can't wait to read the narrative that accompanies this excellent pictoral. You really captured the setting for the race. reminds me of Forest Gump didn't he run in an area like that? amazing pics, glad you got to hang with friends, looks like fun! It was so great to finally meet you! 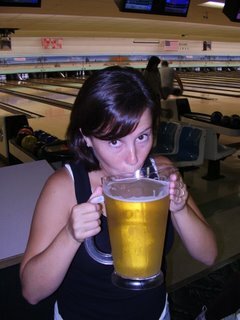 It looks like you got Jacki through with flying colors! She was so positive when I saw her. Congrats goes to you for great work crewing! Did you love it? Are you getting ready to sign up for next year??? Thanks for running with me a bit! It was great to feel the support! Bob - it was a blast. I suppose you should take a look at the tutu pics and get ready for GTR100 ! Marcy - you have no idea...my brain was fried. Joe - anytime. I love crewing and pacing, sometimes more so then racing. Mark - not as hot as past years, but hot enough for me. Jaime - anytime for you. I honestly knew you had it when I saw you out there. It was early, but you were flying. I loved every second of it and hope I get accepted for 2009 !